James Bond, The Italian Job, Formula One Racing, Louis Vuitton Challenge Cup - you name it: if it's chic, particularly if it's Anglo-related, you're likely to see some kind of tie-in with Ty Nant, and for good reason. The utter purity of Ty Nant is attributable to an unusual aquifer lodged in a dense geological formation; the discovery of this source in the Cambdian Mountains in rural Wales occurred in 1976. Ty Nant has no Nitrates, a neutral pH, and very low total mineralization at only 165 mg/l. Ty Nant is lighter overall than its sister brand Tau - mainly because of the lower level of Bicarbonate - although it should be noted that Ty Nant has more Sodium. 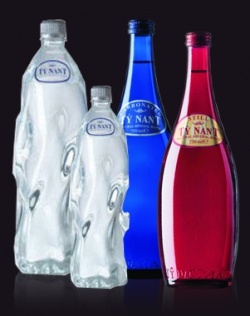 Once famous only for their eye-popping cobalt blue glass bottle shaped like a bowling pin, Ty Nant revolutionized plastic packaging when it introduced its radical asymmetrical design a few years ago. It is easily the most unforgettable, impressive PET (plastic) packaging in the world, with a hard ripple effect that absolutely evokes the fluidity of water. Walk into your gym carrying a Ty Nant 1/2 Liter or 1 liter plastic bottle, and heads turn. Have your waiter bring the blue bottle at your favorite restaurant, and you'll see the same kind of reaction.